Thekla Knös was a writer and a translator who was active in Uppsala during the nineteenth century. 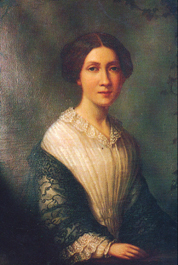 Thekla Knös was born in Uppsala in 1815. She was the daughter of Gustaf Knös, professor of Greek and Eastern languages at Uppsala University, and Alida Knös. She grew up in an educated home and was linguistically talented. Her father died when she was 13. She and her mother remained in Uppsala and became part of the town’s intellectual social scene. Their home functioned as a gathering place for the literary and musical men of the town. Thekla Knös would listen to Erik Gustaf Geijer’s public lectures, along with others including Fredrika Bremer and Malla Silfverstolpe. After Thekla’s mother died in 1855 she entered into a deep depression. Once she came out of it she began to earn a living by working as a translator and a language instructor, whilst also receiving contributions from the Swedish Academy. She spent a few years living with Malla Silverstolpe, and then moved around, living with friends and relatives until she finally settled with her childhood friend, Agnes Geijer. Her melancholic tendencies increased in frequency. When she was in her 50s she began to work towards the establishment of a home for so-called feeble youth, Föreningen för sinnesslöa barns vård, but she once again fell into a depression. She was then admitted to Växjö hospital, where she spent the final years of her life. The roots of Thekla Knös’ poetry lie in Swedish romanticism, which had played a central role in the Uppsala of her youth. Several of her poems are nursery rhymes, for example “Baka, baka liten kaka”. They were set to music and were initially circulated as handwritten copies, until Per Daniel Amadeus Atterbom convinced Thekla Knös to publish them. When he published a volume of her poems in 1852 he praised the simplicity of her poetry. They were evidence that “the bourgeois lyrical realism of the late eighteenth century had never been entirely silenced by the Nardus language of romanticism or Tegnér’s trumpeting fanfares”. Atterbom encouraged Thekla Knös to submit an entry to a competition held by the Swedish Academy. She submitted the poetry series Ragnar Lodbrok and a collection of shorter poems, and was awarded both first and second prize. Ragnar Lodbrok is a heroic poem typical of the Gothic style in fashion at the time. It has been described as lacking in originality, obviously using Esaias Tegnér’s Frithiofs saga as its model. However, unlike the hero in Tegnér’s work, the main character in Thekla Knös’s piece appears in a home setting and in various romantic situations. The versification breaks away from the norms of the genre and hints towards the psychological novel. Thekla Knös also wrote many poems about flowers. Several of them were set to music by Adolf Fredrik Lindblad. As for her translations, these included the well-known Christmas psalm “Det är en ros utsprungen”. Fredrika Bremer and Pontus Wikner became two of Thekla Knös’ closest friends during the latter part of her life. To the young poets in the Namnlösa ("nameless") society “aunt Thekla” was a motherly friend. She appears to generally have been able to gain people’s trust, particularly that of the younger crowd. Friends and acquaintances emphasized her human warmth and selflessness, which sometimes verged on self-effacement. It is said that she refused to wear the then fashionable crinoline because “she did not want to take up so much space in the world”. Thekla Knös died in Växjö in 1880 and is buried in the family grave at Gamla cemetery in Uppsala. Thekla Levinia Andrietta Knös, www.skbl.se/sv/artikel/TheklaKnos, Svenskt kvinnobiografiskt lexikon (article by Anders Jarlert), retrieved 2019-04-20.